I can't think of a drier word than mortgages. I mean, it just sounds like paperwork and - mortgages, really? Is that what we're going to talk about? But what a mortgage can lead to if you spend some time finding the right one is actually really exciting. DEIDRE DOUGLAS: And that moment when we pulled up to the house, I pretended that it was a girlfriend of mine's house. And I just needed to come pick up some items. ARNOLD: Deidre Douglas (ph) had just bought this house. But it was touch-and-go, and so she didn't tell her kids. DOUGLAS: And just played it off like, oh, my goodness, she's not here. Oh, I forgot she left me the key. And so I was like, let's just go in. You guys can come in with me. UNIDENTIFIED CHILD #1: We didn't even have to wait out here. DOUGLAS: And they were just like, whose house is this? ARNOLD: Then they saw the banner that Deidre put up over the fireplace, welcoming them home to their new house. Deidre was taping this on her cellphone. UNIDENTIFIED CHILD #2: Are you serious? DOUGLAS: And that's the moment they just lost it. UNIDENTIFIED CHILD #2: Yes. Thank you, Mommy. ARNOLD: It's actually really touching. Her older daughter in the video starts crying. She's standing in her new room. DOUGLAS: Congratulations, my love. I love you so much. UNIDENTIFIED CHILD #3: I love you, too. DOUGLAS: Oh, my baby girl. ARNOLD: And this moment is brought to you by a mortgage. And actually, Deidre was able to buy this house because she found a kind of loan that most people don't even know exists. This is your NPR LIFE KIT for home ownership. In this episode, mortgages. I'm Chris Arnold. I cover personal finance and consumer protection at NPR. And we're going to cover the basics but also tell you about mortgages and deals that could save you a lot of money on payments and interest, even how to find free money for a down payment in some neighborhoods across the country. ELYSIA STOBBE: You can get up to $22,000 in homebuyer down payment assistance. BRUCE MARKS: In Charlotte, you get up to $18,000. In Atlanta, you can go to $20,000 to $25,000. ARNOLD: Its mortgage bliss. We're going to learn how to get there right after this. ARNOLD: OK, so Deidre and her kids - they love their new house. It's in Charlotte, N.C. They're all moved in. DOUGLAS: I have a sun room. Especially when the trees are in bloom, it's like my own little world. I have a creek also in the back, too, so especially if you have a nice rain, you can hear the water drifting down the river - not river but little stream. And this is just my serenity space. DOUGLAS: After pulling credit histories, my credit score wasn't really as high as they would like to qualify for a good interest rate. You know, a lender has stated to me it was like it was not a reachable goal. ARNOLD: And here's the thing - when you go to a bank to find out about a mortgage, depending on where you go, you could be told very different things. And this brings us to our first takeaway. Tip No. 1 - you want to shop around. There are all kinds of different mortgages and programs out there, especially if you're a first-time homebuyer, and a lot of good options out there that you might not know about. In Deidre's case, that one bank told her that she could even be a homeowner. She'd gone through a divorce recently, ran up credit card debt just to make ends meet with the kids. And her credit score was pretty low. But she had a good job. And she was getting back on her feet. And a friend told her about a way to get a mortgage from a lender that ran a first-time homebuyer program. DOUGLAS: They were telling me about this amazing program and how they had to go through a process, which was a nice - it was a tedious process, but the end result was amazing. MARKS: We don't look at someone's credit score. And, you know, she could afford the payment. ARNOLD: That's Bruce Marks. He's the founder and CEO of a nationwide lender called the Neighborhood Assistance Corporation of America, or NACA for short. And basically, Bruce has dedicated most of his life to making loans to everyday working people on moderate incomes so that they can become homeowners. MARKS: It's going back to the old way of doing lending. And what we believe in is what - called character-based lending, you know, which is what we used to do in the past. So character-based lending is you look at people's individual circumstances that they control. ARNOLD: So it's not about the credit score. It's about, are you paying your rents and your bills on time? In Deidre's case, to get that loan from NACA, she had to take a homebuyer class, demonstrate over time that she was saving money, and she paid off $11,000 of credit card debt. DOUGLAS: And they want to see a savings pattern, like, every month. And so you meet with a credit manager. And they will just sit down to go over every single expense that you have, what you save. It was hard. It was very hard, but I did it. And if I could do it, anybody can do it. ARNOLD: And even if you're not in the exact same situation as Deidre, looking around at other lenders like this can find you a much better deal. In her case, she qualified for a loan with much better terms than she could have gotten from a regular bank, given her low credit score. By the way, credit scores are really important if you're getting a loan from a traditional bank. A lower credit score means you pay a higher interest rate, costs you more money. So Deidre was able to get around that. DOUGLAS: I ended up with a nice, low interest rate on my home versus - a regular traditional loan for a home at that time was, like, 6 or 7 percent, where I got mine for 4. ARNOLD: She also had a very low down payment, no mortgage insurance - more about that later. But the bottom line is Deidre is saving hundreds of dollars a month, thousands of dollars a year because she shopped around and found this program that was right for her. STOBBE: I mean, it's amazing what's available if you just look and ask. ARNOLD: That's Elysia Stobbe. She works with a mortgage company out of Florida called NFM Lending. And she's written a book about how to get a mortgage. She says one big misconception out there is that a lot of people still think that they can't buy a home because they can't get a mortgage if they don't have a 20 percent down payment. STOBBE: There's great first-time homebuyer programs where you can put down as little as 3 or 3 1/2 percent. There's also loans that have 100 percent financing in certain parts of the country, so that's zero percent down. ARNOLD: And these are not the crazy, risky, subprime-type mortgages that helped caused the housing crash. For example, one very legit and popular mortgage is called an FHA loan because it's backed by the Federal Housing Administration. And for that, you only need to put about 3 percent down. Then there are loans for when you buy a fixer-upper - a lot of people don't know about these kinds of loans - where you can borrow more than the purchase price of the house so that you have money to renovate it before you move in. FHA has a loan like this. It's called a 203K loan. That can be a way to buy a more affordable house in a nice neighborhood because it needs some work. But Elysia says make sure that you're actually going to be up for taking that on. STOBBE: I think getting involved in building and rehabbing is definitely a challenge because the stress of moving and buying the house is its own stress. And then doing renovations on top of it - it might be perfect for some people. And we've had clients that have done it. And it was exactly what they needed. And they were thrilled with it. And then we've had other clients where it was what they wanted at the time. And, you know, we've had feedback that, maybe I didn't want to live in construction for three months. ARNOLD: Yeah. And Bruce says one deal you definitely want to look around for - and this is tip No. 2 - find out if you qualify to get free money to help you with a down payment. If you're a first-time homebuyer or you haven't owned a home for at least a few years, you might qualify for a government grant for what's called down-payment assistance. And that could mean borrowing less on your mortgage. MARKS: There's a lot of grant money around for down payment and closing costs. So, like, in Atlanta, you can go to $20,000 to $25,000. Boston - up to $20,000. In California, they're doing $40,000, $50,000 and sometimes more. STOBBE: In Charlotte, N.C., depending on what zip code you're actually buying there, you can get up to $22,000 in homebuyer down-payment assistance. It's phenomenal. ARNOLD: And, I mean, that sounds like one of these things that's just too good to be true. I mean, why in Charlotte, N.C., or places in Florida, like, why is there just free money for you if you're going to - to use for a down payment if you agree to buy a house somewhere? STOBBE: So that's a great question. And the reason it is zip code specific or county specific is because they are trying to, you know, invite people to build a community and be homeowners and contribute. ARNOLD: Basically, it's a community-development-type thing. They're incentivizing people to invest in a neighborhood by buying a house or a condo there. MARKS: Absolutely. And one of the things when you say it is free money, which it is - but what they do is they put a recapture agreement on because what they don't want is they don't want investors or people to flip the properties. So what they'll say is, you don't have to pay it back as long you stay in a house for five or 10 years. You know, each one is a little bit different. And that's the correct way to do it because what they're looking for is they want someone to live in their city for an extended period of time. If you're getting that free money, well, you shouldn't be able to be an investor to flip it, that house, and make money off of that. ARNOLD: OK, so how do you find out about what sort of homeownership incentives might be available in your area? And what's a scam and actually is too good to be true? Bruce says the mortgage world definitely has scams and shady lenders out there. MARKS: There's more abuse in the mortgage industry than any other industry in the world. Always be skeptical. ARNOLD: Bruce says a good place to go when your shopping around for a mortgage is your state housing finance agency. Each state has one. And they should be able to tell you about the down payment assistance incentives that might be available in your area. And they might be able to put you in touch with a reputable first-time homebuyer class. And since you're about to dive into the biggest financial endeavor of your life so far, it's probably not crazy to learn more about what you're getting yourself into like Deidre did. OK, our next takeaway is a quick but important one. We mentioned this in our How To Buy A House episode. Call this tip No. 3 - you want to get what's called preapproved for a mortgage before you get serious about looking for a house. And there's a bunch of reasons for this. For one, you need to know how much a lender is willing to loan you, so you don't go look at $400,000 houses, and a bank will only loan you $300,000. But also, being preapproved gets realtors to take you seriously. So it's kind of like the preapproval for the mortgage is kind of like this magic ticket. MARKS: Absolutely. Full documentation, preapproval. And that allows you as the homebuyer to really understand what you can afford and where you can buy. And it gives the confidence to the real estate agent and seller that you're going to close on this transaction. ARNOLD: Now, you may not - and you probably don't want - to borrow the full amount the lender is willing to loan you. But you find out what's possible, and you go from there. ARNOLD: All right. So this next thing that we're going to talk about is something that I actually wish that I understood a little better when we bought our first house. And here it is - as you shop around, one big choice to make is whether to get a 15-year or a 30-year mortgage. And this is actually a very big deal. And here's one way of thinking about it. You know when you're at the airport, you're lugging a bag. And you're getting to the plane and whatever. And you look over. And you see somebody next to you get on one of those moving walkways. And they're just like zooming ahead. They're going, like, three times faster. In the world of mortgages, those are the people with 15-year mortgages. And if you're just walking along, dragging your bag in the slow lane there, that's what it's like to have a 30-year mortgage. Those people on the 15-year moving walkway, they're getting to where you both want to be much faster and in some ways that you might not fully appreciate. OK, so this is our next tip. No. 4 - if you can afford a 15-year mortgage, do it. You will build wealth so much more quickly. STOBBE: Oh, it's phenomenal. I'm a huge fan of the 15-year term. I have a 15-year myself. And I think it's a great product. And it's amazing just how quickly you build equity. It's phenomenal. ARNOLD: Building equity - just explain that quickly. With each mortgage payment, some of your money just goes to pay interest to the bank. That doesn't help you at all, just paying interest. And the rest of the money goes to actually pay down the amount that you owe on the loan. That's called paying off the principal. And that's how you build equity. You're building your ownership in this house. And this is the part that I wish I understood a little better when I bought a house a long time ago. Of course, the payments are higher with the 15-year mortgage. But more of each dollar goes towards the principal instead of the interest. So after just five years, you've built up about three times more equity with the 15-year loan. So I'm going to say this again because it's really important. Forget the 15 and the 30, whatever, just after five years, your first five years in the house, you own three times more of the house with the 15-year loan. You were just zooming down that moving walkway towards owning more and more of your house. But the lower monthly payment on the 30-year - that means that most of us end up just going with that one, the slow one. STOBBE: You know, most people just want the 30 because that's the - that lets them buy the house they want to buy. But yeah, if you can pay it off in 15 or 20 years, holy cow, you save a ton of interest and time. ARNOLD: Elysia says you can also look at 20-year loans. They have lower monthly payments. And they still build equity much faster than a 30 year. And at the end of this episode, hang in there with us because we got a tip about a special kind of 15- and 20-year loan that's more affordable. ARNOLD: Our next takeaway is about fixed interest rate loans versus adjustable rate loans. Now, with a fixed, your mortgage payment is fixed. It's pretty simple, right? It's locked in. It's not going to change ever unless you refinance or pay off your mortgage. So think about it this way. If mortgages were cars, a 30-year fixed rate loan is like a dependable minivan or SUV. Now, with an adjustable mortgage, the interest rate you pay fluctuates up and down depending on what rates are doing in the market. The payments start out being lower with an adjustable, but you run the risk of them going up. So maybe it's more like a used car that you get for cheap, but you also kind of worry. I don't know. This car's pretty old. It might have some problems later. And with mortgages, if things go wrong, they can end up costing you a lot more money down the road. MARKS: I mean, the variable rates are - it's risky. So for the vast majority of people, the risk is not worth it. This is your biggest investment that you're going to be making. Make it a solid, conservative investment because you have a mortgage payment that you can afford. ARNOLD: OK, and the idea with the 15 versus the 30 - the 15-year fixed might be like that nice, safe car with the airbags just with a bigger engine that's going to get you where you want to be faster because you're going to own your home a lot quicker and build up equity a lot faster. MARKS: Absolutely. I mean, you are just going 100 miles an hour versus 20 miles an hour. ARNOLD: But OK, look. It's not like adjustable mortgages are sleazy products. It's not like there's some used car guy kind of pushing you into them. But they are riskier. And you have to know what you're doing. And some are a little less risky. Elysia says one that you could look at as a five- or seven-year ARM - they're called. It just stands for adjustable rate mortgage. And that means that the interest rate is fixed. And it's not going to change for five or seven years. And then it starts adjusting. Elysia says look. If somebody is sure that they're going to sell the house and move before the rate adjusts, OK, fine. But she and Bruce both feel that the risk isn't worth it. STOBBE: I like fixed myself. I'm much more conservative. You know, you don't want to be that person that did adjust, and you got stuck. And it went up instead of down. ARNOLD: OK, now we're into the fun stuff, guys - mortgage insurance. But actually, this is really important. Here's how it works. When you make a big down payment when you buy a house, banks like that. You put a big down payment down. And the magic number is 20 percent down because if you do that, it's a safer loan for the bank. Your down payment gives them a cushion. Now, it's not like a soft, friendly cushion. It's more like a tactical bank-type cushion because if you lose your job, they can spend the money and time it takes to foreclose on you and sell your house and hire lawyers and deal with all this stuff and still get all their money back. That's what the big down payment does for them. STOBBE: Correct. So PMI stands for private mortgage insurance. And typically, anytime you put down less than 20 percent, you're required to pay mortgage insurance. And basically, you're paying insurance in case you default on your own loan. So it's just the same as, you know, car insurance, but it's for your own mortgage. ARNOLD: You're paying insurance to protect the bank, though, not, you know, your car. STOBBE: Yes, exactly. Exactly. And that's the price you pay for the risk of, you know, putting down as little as 3 percent. ARNOLD: OK, this is a key concept. Mortgage insurance protects the bank, not you. And it's not cheap. So if you can avoid paying it, that's great. You should avoid paying it. And here's our next takeaway that not too many people know about. Tip No. 6 - you can sometimes escape paying PMI, this mortgage insurance, and save a lot of money on your mortgage. So one way that this works is, again, just to shop around. If one lender is going to charge you PMI, you still might be able to find a credit union or another lender who will offer you the same loan but not charge you the mortgage insurance. And, for example, Bruce's outfit, NACA - they don't charge mortgage insurance ever. MARKS: Absolutely. So, you know, there are options out there. You know, there's good mortgages out there where you don't have to have the high mortgage insurance. So, you know, if you are - if you want to be a homeowner, do your homework in advance. You've got to look around. ARNOLD: Some of these low down payment loans with no mortgage insurance are called wealth builder loans. MARKS: The best mortgage that you've never heard of is the wealth builder 15-year mortgage. If you can afford the payments, you need to do that. Build equity really quickly. ARNOLD: OK, so here's how this works. All a wealth builder loan is is a 15- or a 20-year loan with a very low down payment and no mortgage insurance. And this is the big idea behind them, what makes them really powerful - they help you build equity faster for not that much more money every month than, say, an FHA 30-year. And the reason is because with the FHA loan, you've got to pay the mortgage insurance. With the wealth builder, you don't pay the mortgage insurance. So just by stretching a little bit, you can get on that fast-moving walkway and start building equity much, much more quickly. STOBBE: It's amazing. It's such an amazing difference. And people don't realize what a little extra couple hundred bucks every month does. It's a huge change to their benefit. ARNOLD: Avoiding mortgage insurance on FHA loans in particular recently became even more important because the mortgage insurance used to only be in place for a period of time. But now it's permanent for the life of the loan. ARNOLD: One last point. Once you've bought your house - you've owned it for a while - you've built up some equity in your house - there is actually something lurking out there that you need to be careful about, maybe even afraid of. There is a monster out there - a monster. And it's called the HELOC. And that sounds like a monster - right? - from ancient times. Oh, the dreaded HELOC. Save yourselves. OK, that's like my best B-movie hapless peasant facing the dreaded HELOC monster. MARKS: Oh, they have to be real careful. I mean, this idea that you can use the equity to fund your lifestyle is just a recipe for disaster out there. And so you have to be really, really careful that you can afford that. You got to pay it back. And it puts your house at risk. And so, you know, if you have high credit card payments, if you have high other debts - that's unsecured other debts - do not refinance. Do not get a home equity loan to pay that off. Don't put your house at risk. ARNOLD: And that's our final tip. No. 7 - don't let the dreaded HELOC monster eat your home equity. Save yourself (laughter). ARNOLD: So there you go - what you need to know to head out into the mortgage jungle and find a loan that's right for you. Now, we covered a lot of ground. So to help us remember the most important things, here come the takeaways. Tip No. 1 - shop around for your mortgage. You don't just want to go to one lender. If you do shop around, you just might find a deal that could save you thousands of dollars a year in payments. STOBBE: You do not need a big down payment. There are plenty of loan programs available. For first-time homebuyers, these are great programs. So find out about them. ARNOLD: That goes along with takeaway No. 2 - find out if you qualify for free money - free money - to help you with the down payment. Who doesn't want that? MARKS: There are a lot of affordable mortgages out there. And there's also a lot of grant money out there for down payment and closing cost assistance. The opportunities are there. Take advantage of that. ARNOLD: No. 3 - getting preapproved for your mortgage is your golden ticket to being taken seriously by those sellers and realtors and, when you find the right house, closing the deal. MARKS: Getting preapproved for a mortgage is crucial. To eliminate those barriers, you just have to do that. You've got to do the work in advance. STOBBE: 30-year loans are affordable. But you can build equity much, much faster with 15- or 20-year loans. This is like putting cash in your pocket. ARNOLD: So jump on that fast-moving walkway, building way more equity and wealth in your home, and your future self will thank you for it. OK, No. 5 - unless you're a mortgage pro or just like to do extremely risky things, you almost always want a fixed rate loan, not an adjustable. MARKS: The vast majority of people should get a fixed rate mortgage, not a variable rate mortgage. ARNOLD: No. 6 - escape PMI if you can. Run away from that PMI. Do not pay mortgage insurance if you don't have to. And finally, No. 7 - beware the dreaded HELOC monster, or it will eat your home equity. STOBBE: Be very careful with home equity loans. These are not right for everybody. ARNOLD: And remember, you can find a great mortgage. And you can do this home buying thing. DOUGLAS: And if I could do it, anybody can do it. 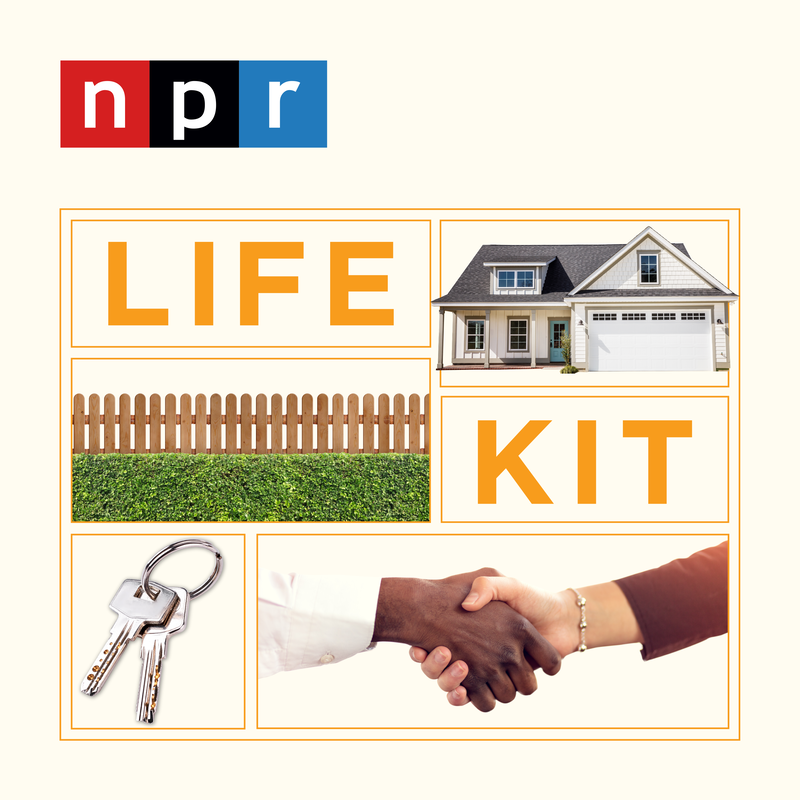 ARNOLD: For more LIFE KIT, check out our other guides at npr.org/lifekit. And while you're there, subscribe to our newsletter, so you don't miss anything. We've got more guides coming out every month on all kinds of topics. We got one guide all about sleep - everything from creating sound sleep rituals to battling insomnia. And here, as always, is a completely random tip, this time from NPR's Diba Mohtasham. DIBA MOHTASHAM, BYLINE: So one definite way to tell if your avocado is perfectly ripe to eat is to check under the stem. If it's green under, then you know it'll be a nice green and creamy on the inside. But brown means the avocado is overripe and will have brown spots underneath. If the stem doesn't come off at all, it needs more time. ARNOLD: If you've got a good tip or you want to suggest a topic, email us at likekit@npr.org. I'm Chris Arnold. Thanks for listening.